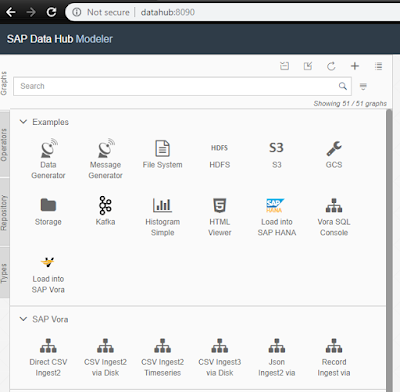 In line with my concept of always learning something new this article will be focused on automating data flows with SAP Data Hub 2.4 pipelines. 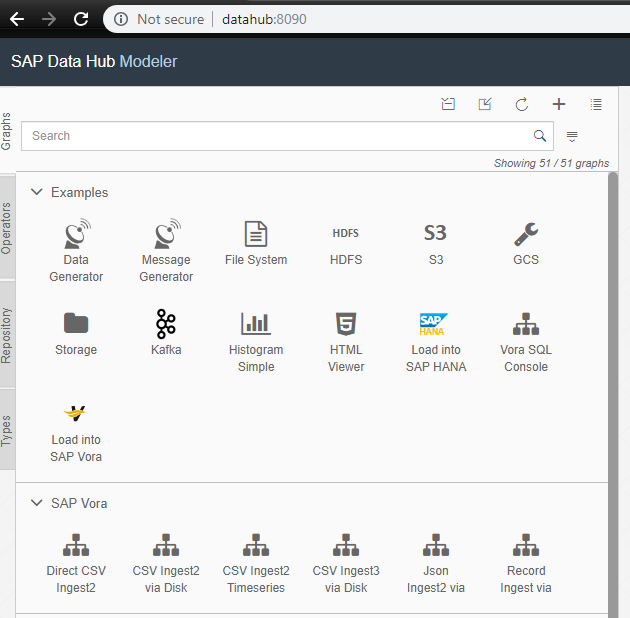 I will be using the developers edition of SAP Data Hub 2.4 which is delivered as the Docker image, which yet again makes our life so much easier. Since then I moved on and instead of using Ubuntu as a host OS for Docker I started using extremely lightweight Alpine Linux distribution for all my Docker containers. I find that for containerisation the golden rule is “the lighter your host OS – the better”, which makes Alpine a perfect choice and all SAP containers work fine in it (so far, even though it’s not officially supported for HXE or Data Hub containers). 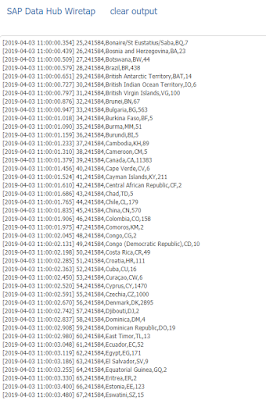 In this article I will start everything from the scratch, creating two separate tables to store Country and Constituency results and adding few new columns to store multiple petitions in one table. I won’t be explaining the path all the way to SAP Analytics Cloud as I have explained it in great detail last time. What we will be achieving today is extracting data from those two petitions in one go to our SAP HANA system via SAP Data Hub. Don’t be afraid! I will take you through the process of this pipeline creation step by step. There is surprisingly scarce in-depth information about practical Data Hub pipelines online, so I had to discover it piece by piece through trial and error. Now, let’s start creating new graph! On the left-hand side pane choose “Operators” and drag “Blank JS Operator” to your graph workspace. 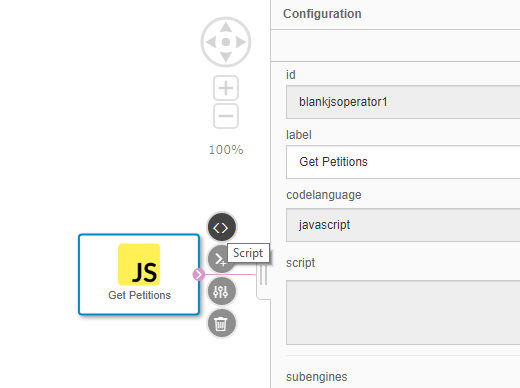 This would be our starting operator which we will use to start the pipeline and create the GET request headers to acquire petitions from the petitions website. 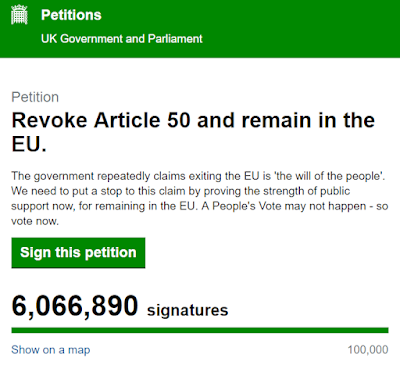 Rename it to “Get Petitions” and add the following code to it by clicking the “Script” shortcut. 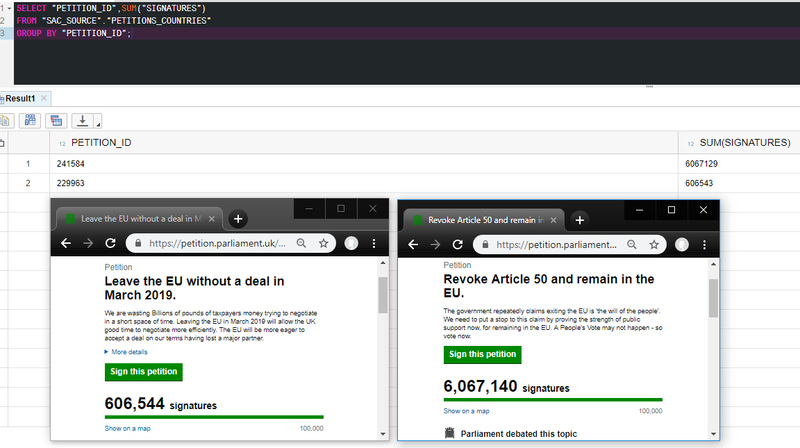 Here we are specifying the petitions we require in the array variable and then looping through array creating the correct headers. Right click on our JS operator and select “Add Port”, create it as follows. 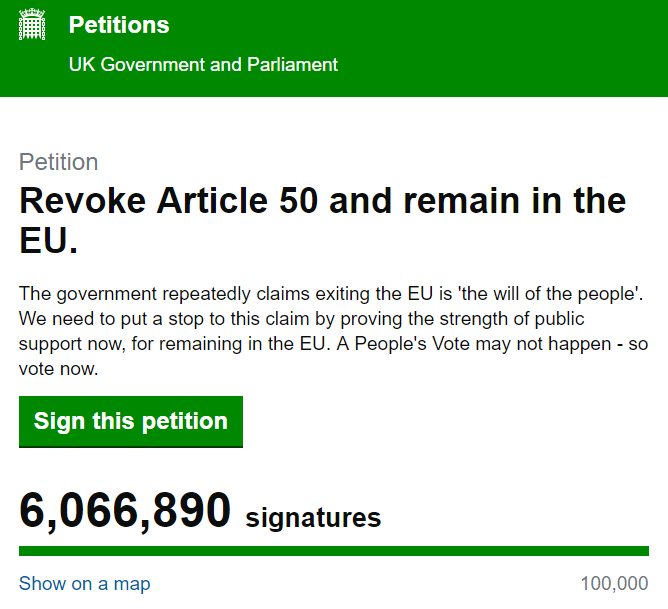 What we did is we connected message via string converter to the terminal to check the output of the “Get Petitions” operator. Save your graph and run it. Wow, that’s cool! Now close the terminal and stop your graph. 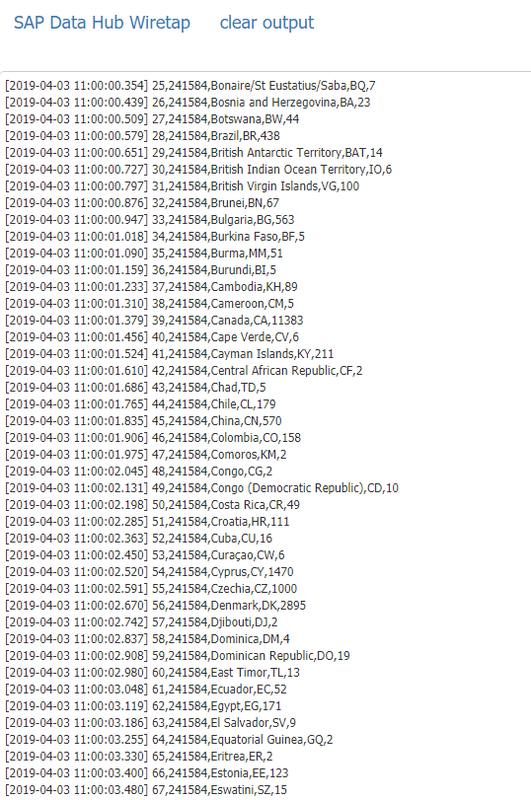 Now that we have a properly formatted GET request header, we can actually get data from the URLs specified. Delete “ToString Converter” and “Terminal” operators for now (but we will use this monitoring concept throughout this post). Drag “HTTP client” operator and connect it to JS operator like shown on the image. To test the data output from “HTTP client” use another operator – “Wiretap” which can be used for any input data (unlike “Terminal” accepting only strings) and connect it. Great stuff! 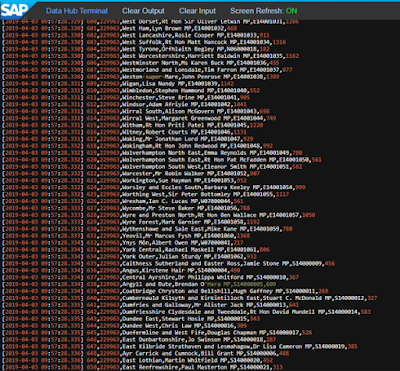 Now what we need to do is to parse this data and load it into SAP HANA tables. Let’s carry on doing that. As you can see we have got one input port and two output ports in our “Convert Data” operator. 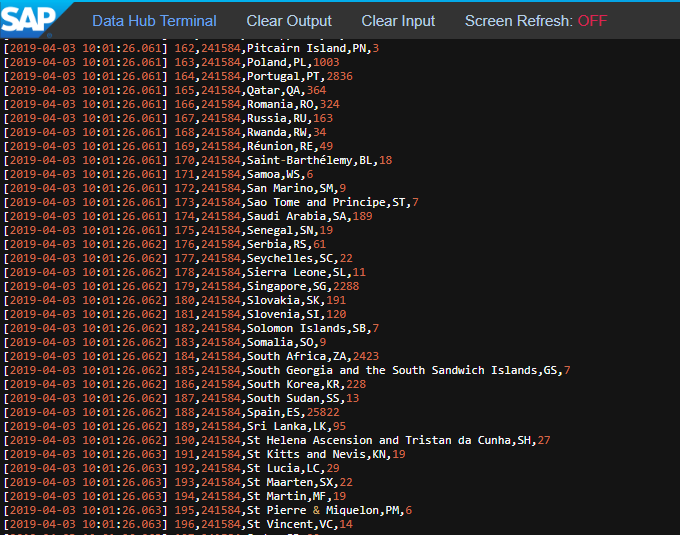 We are parsing incoming JSON and outputting countries and constituencies data on two separate ports for it to be then into two separate tables in our HANA system. Alright, that looks like it should, following JS operator parsing. 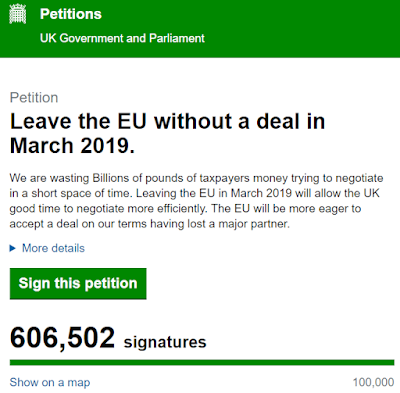 We have constituency data as “ID, Petition ID, Constituency, MP, ONS Code, Signature Count” and country data as “ID, Petition ID, Country Name, Country Code, Signature Count”. Just the way we want it. 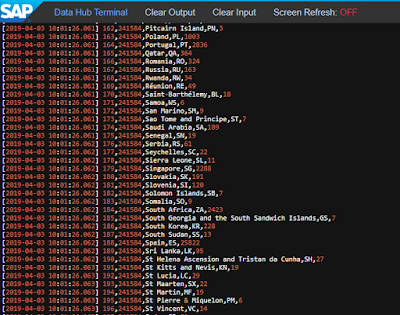 Now that we know that it works, it’s time to load the Country and Constituency data to SAP HANA tables. 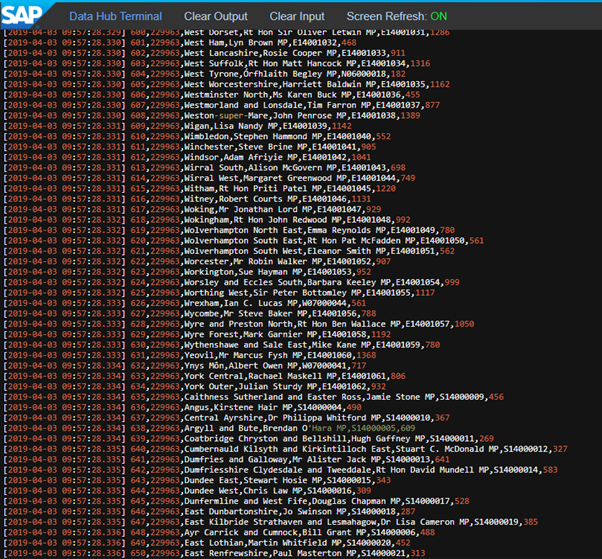 There is no need to create new tables in Catalogue manually, “SAP HANA Client” operator will do it for us. 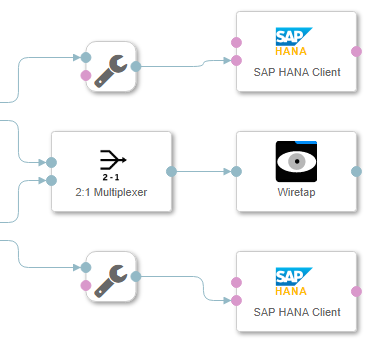 The reason we are doing this is so that we can monitor the outputs into HANA via a single “Wiretap” writing data into tables simultaneously. Remember that the first output is Country relevant information and the second output is Constituency relevant information. Set table initialisation to “Drop (Cascade)” – this means that HANA will check whether the table exists and drop it (there are of course ways of just updating the values in table). 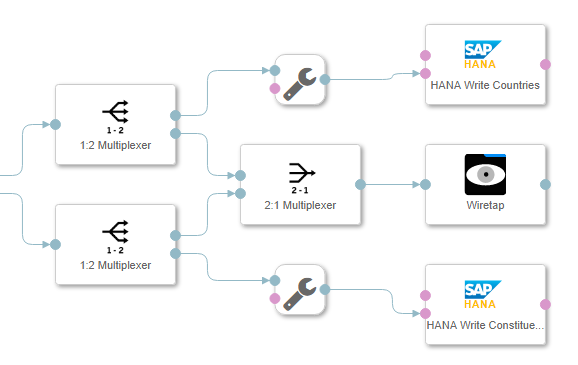 Now, let’s save the graph and check our schema catalogue in SAP HANA. Everything seems as it was last time. 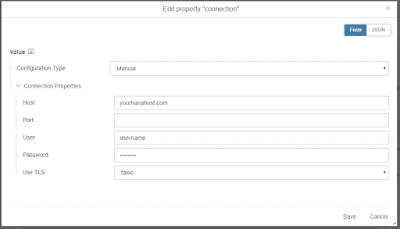 Check HANA catalogue and find two newly created tables in there. Check that the “Wiretap” stopped refreshing – this means all the data should be passed to the tables. It’s important to note that sometimes pipelines just stall and do nothing even though the status is “Running”. This can be resolved by stopping Data Hub container and restarting it. I am not sure if it’s only happening in Dev version, but it’s a bit annoying, for sure. 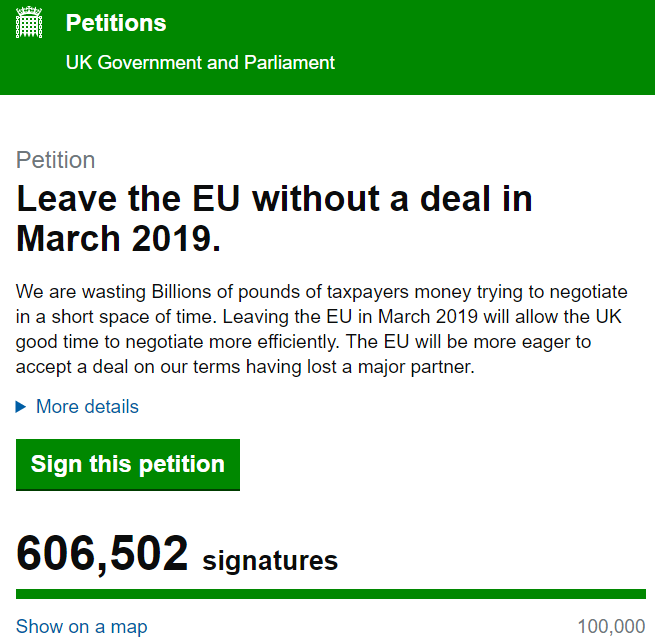 The petitions online aren’t completely stale, so while I was taking the screenshots, they have moved a bit, but you get the point – it is as close to the real data as the processing time of Data Hub pipeline allows. For the purposes of this analysis we actually don’t really need the real live data, time lag of 30 minutes to a day or so will be fine. The pipeline graph can be scheduled to run every day, every hour, or any other time period you require to process live data from the system. 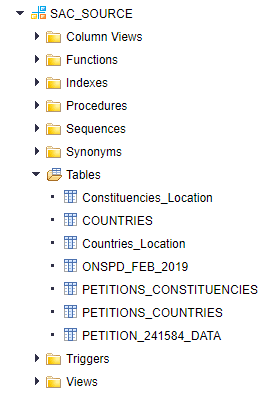 ◈ Create two calculation views for Countries and Constituencies based on their respective tables. SELECT DISTINCT "PCON" FROM "SAC_SOURCE". 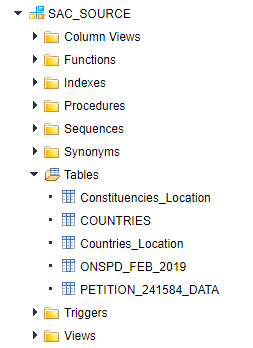 "ONSPD_FEB_2019"
SELECT DISTINCT MIN("LAT") "LAT", MIN("LONG") "LONG", "PCON"
This script will update the constituencies locations table to have the location of all the constituencies in the country and not only the ones from the particular petition. 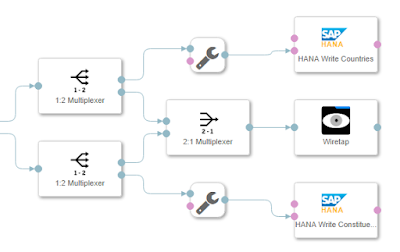 ◈ Create SAP Analytics models based on the new Calculation Views or update the existing ones. 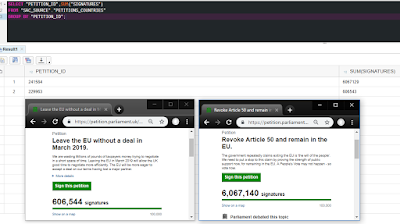 ◈ Create a new story and add Geo map there, filtering based on the petition ID – that way country and constituency will always be in sync based on petition id.